Have you recently fallen in love with Graphic Facilitation or Graphic Recording … or, has it been a while and you are finally ready to give it a go? 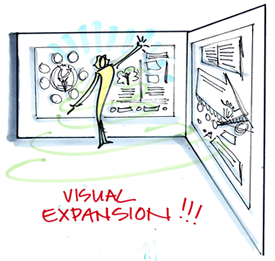 Do you use Graphic Facilitators and/or Graphic Recorders in your meetings? Or want to do this role yourself? Did you know these effective visual methods also work really well in coaching, therapy and personal growth settings too? These are the kinds of circumstances under which people usually find their way to me and my internationally recognized training The Fundamentals of Interactive-Visuals. 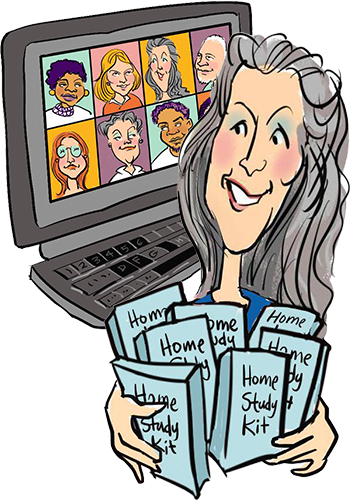 Hi, I’m Christina Merkley and I’ve got 20+ years experience in working visually across the FULL spectrum of applications: Studio Work, Graphic Recording, Graphic Facilitation and Graphic Coaching. And rich experience across the full gamut of environments: Corporate, Not-for-Profit, Governmental, Small Business and Solopreneurs. I’m VERY SKILLED at teaching these methods, no matter what level your artistic or process skills are it. I’ve taught leaders, managers, consultants, facilitators, trainers, authors, coaches, therapists, accountants, teachers, lawyers, analysts, artists, illustrators, designers, admin assistants, etc. And folks already operating as Graphic Facilitators and Graphic Recorders, either embedded in organizations or as freelancers. 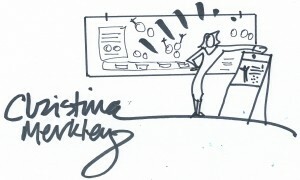 Graphic Facilitation and Graphic Recording are excellent process methodologies, when EXECUTED PROPERLY. Yes, working visually is attractive … it’s calculated that 87% of the general population are Visual Thinkers. So most people (even engineers, techs and accountants!) are attracted to the color, shapes, lettering and icons/pictures in this method. But please do not be fooled by some of the less than quality work floating around, now that working visually has finally become hip; this method ultimately isn’t about pretty pictures and doodles! 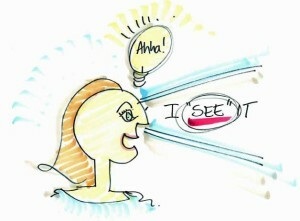 When used properly it’s about CLEAR and DIRECT COMMUNICATION of information, ideas, thoughts and feelings. Something every leader and Process Professional needs more of in the course of her/his work. My course is a comprehensive, complete program. It gives you everything you need to understand and start working visually ASAP. Again, this course is not just about drawing (although we do thoroughly cover drawing in the basic skills section). It covers EVERY COMPONENT you need to start weaving visuals into your own work, including; basics skills, formatting, drills in all four ways of working, loads of portfolio examples, reproduction and digital methods plus space, contracting, marketing and mindset considerations. Via public workshop or private training. Via in-house training where you provide a room with lots of walls! Via 9-week webinar course (offered twice a year). Via my new Home Study Kit. 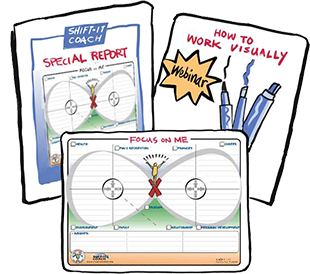 This course is one of the pre-requisites to become a Certified Visual Coach. Check out the combo options for price savings if you are a Coach, Therapist or other Helping Professional who works with individuals. Click the links above for full details, testimonials and registration on each delivery option. Also, I’m happy to offer a free Exploratory Chat (up to 30 minutes) to help you determine which option is best for you.Simply email my assistant at admin@shift-it-coach.com and she’ll help to schedule our chat. Looking forward to getting you up to speed in the visual way of working! P.S. For our full course schedule, click here.